Most people who watch Agents of S.H.I.E.L.D. agree that Season 4 was the best, with it’s interlocking pod-story arcs, introduction of Ghost Rider, LMDs, and the politically-charged Framework storyline — but Season 5 appears to be going in a completely different direction, while still maintaining the same urgent storytelling style. And this is why I think Agents of S.H.I.E.L.D. remains one of the best superhero shows on TV — because it does something I’ve seen no other superhero show do. It reinvents itself. Not just once, but each season. Season 1 is, obviously, the slowest of the seasons. It’s the beginning that turned people away with how, well, boring it was. And yes, a lot of it was boring — I can’t defend the “practical joke” subplot from “Repairs” if I tried. But as soon as Captain America: The Winter Soldier hit, the show reinvented itself. It began to hit the gas and it never stopped. It went from a spy procedural to a conspiracy thriller, with the threat of Hydra and double agent Grant Ward. Season 2, then, took this reinvention and ran with it. It mixed spy fi action a la Mission Impossible with conspiracy thrillers...until the middle of the season, when everything was overturned again and introduced the superpowered side, not just as a cameo or side character, but as a main character. Skye now had genuine superpowers and we were introduced to the Inhumans, which changed the show from then on. Season 3 mixed the spy fi hijinks and conspiracy thriller materials, then, with more Inhuman science fiction. In fact, the science fiction aspect was ramped up by “4,722 Hours,” which took place completely on an alien world. By the time Season 3 ended, however, quite a few fans were tired of the Inhuman plotlines. So what to do? Well, introduce the goddamn Ghost Rider for Season 4. The most obvious reinvention, Season 4 turned the show partly into a supernatural horror show, with ghosts and Ghost Riders. And then Season 4 shifted again, turning back into a conspiracy thriller, but this time with robots. It amped up the paranoia, turning out a near perfect episode, and then shifted again into a dystopian-alternate-reality story. And then, in the last episode, it brought all three stories together. 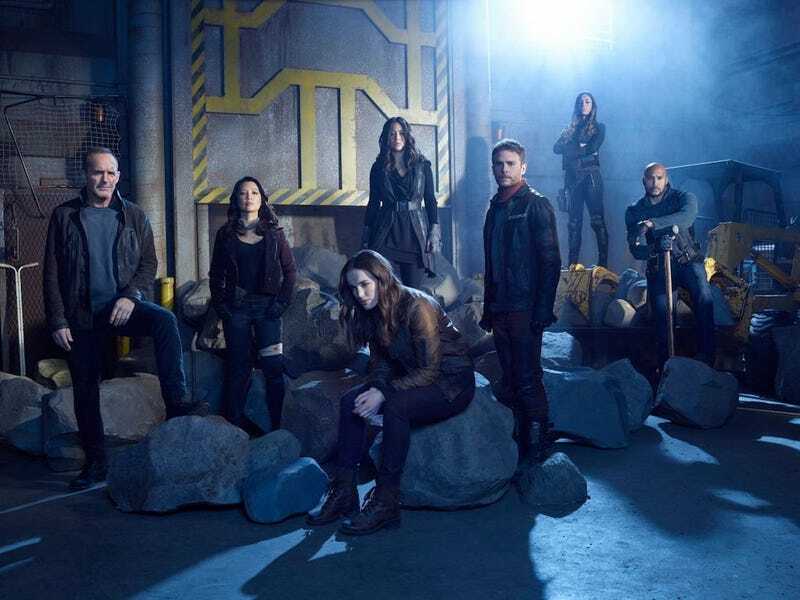 And now, in Season 5, it shifted full swing into science fiction, incorporating space and time travel, having our protagonists flung into the future (one might even call it Agents of S.H.I.E.L.D. 2099) where the Earth was destroyed in a mysterious cataclysm. There are tons of questions to be answered about the show. But the one that I need having is the one that the show keeps changing: what next?